Travis likes to build with Legos and building sets. He also enjoys making crafts and paper airplanes. He is good at imaginative play. He likes Star Wars and Minecraft. Travis is working on coping skills and learning about appropriate boundaries with children and adults. 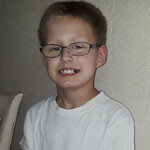 Travis needs a patient and dedication family who is able to manage his medical needs. He would love to have a "nice mom and lots of toys." He would do best in a home where he is the only child and there are no pets.